Whether you are doing it on your own or with help, you will have to carefully measure out the dimensions of your ceiling, and mark where you want to put the drywall. This will allow you to make any cuts on the sheets as needed. As the drywall can be quite heavy it might be easier to mount a 2×4 (does not have to be a full 8 feet, can be 6 feet) on the wall and screw it about three-quarters of an inch away from the rafters on the ceiling, this will allow you to fasten the dry wall between the gap of the mount and the ceiling. Another tip is to cut some spacer blocks from remaining wood and cut a small wood piece (around 2×4), then drill a hole through the middle of the two pieces and add a washer. Measure how many sheets you have, for example, you have around 4 feet of dry wall to fasten on the ceiling by yourself, fasten the stacked block a little past 4 feet from the wall and you can use that as a hinge to hold the sheet in place. This will make holding the dry wall in place a little bit easier. You will often encounter electrical circuits on your ceiling. Before starting use a string with a plumb bob attached to it and hold it in the center of your electrical circuit box, let it hang down and once it is centered on the floor mark a cross. You might need some extra help from this step but it is a great little technique to perfectly measure out where the electrical boxes are all located. Once the dry wall sheet is on the ceiling, you will just need to take the string and move it around until you are perfectly in line with the center of the cross on the floor. Once you have found the electric circuit, cut a little hole and use your rotozip to finish off cutting the hole. All the credit for this technique goes to Mike Fifer and his YouTube video. 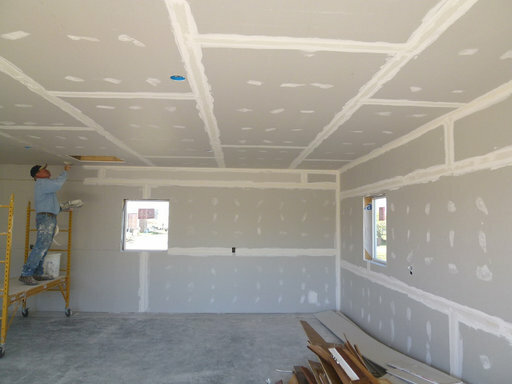 However, you can always just measure where the lights or electrical boxes are and then mark them on the drywall sheet. 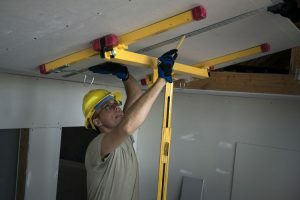 The above technique of using a wood hinge to fasten the drywall sheet in place is good for when you are doing this on your own, however, you can also use rent a drywall lift that will help you hold the and lift the drywall in place. This might benefit if your ceiling is quite large. In general, when you are screwing in your drywall keep it around 3/8” away from the edges, thereby you don’t fracture the drywall. Nails are easier for when you are putting this up by yourself, you can use a screw gun if you are more comfortable. In addition, stagger the joints between each sheet, as this will strengthen the walls. If you have other suggestions for hanging drywall on the ceiling, please Submit Your Tip.